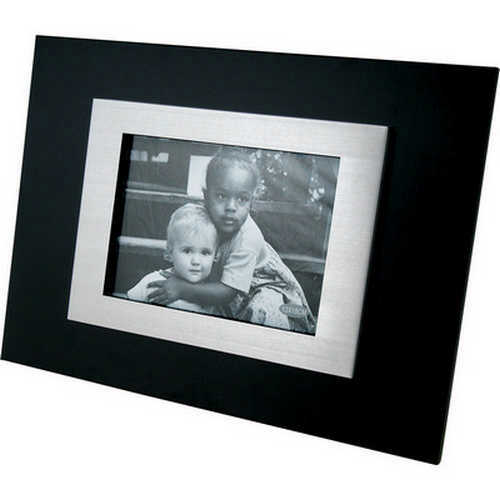 Large desktop photo frame. Stailess steel and Aluminum frame. Suitable for 5 x 7 prints. Large branding area. Engraves silver on the black frame. Product Size: 350 x 250 x 10mm. Product Packing: Boxed. Decoration Size: 70 x 30mm. Decoration Position: Front face. Decoration Method: Pad Print | Laser Printing. Carton Quantities: 12. Carton Size: 38 x 34 x 29. Carton Weight: 12. Colour: Black/Silver. Price includes : Pad Print 1 Colour / 1 Position. Setup is included.